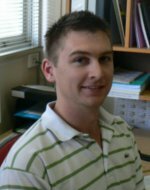 I completed my doctorate in Exercise and Sports Science at the University of Queensland before joining UNE in January 2011. I have a keen interest in high performance sport, in particular, optimizing performance and minimizing injury through advancing methods of performance analysis, load monitoring, training and recovery. I have undertaken projects of this nature in both team (Australian Football, Rugby League & Rugby Sevens) and individual sports (Cycling, Rowing & Rock Climbing). Furlan, N., Waldron, M., Osborne, M.A., Gray, A.J. (2016) Ecological Validity and reliability of the Rugby Sevens Simulation Protocol (R7SP). International Journal of Sports Physiology and Performance. 11(6), 749-755. Furlan, N., Waldron, M., Shorter, K., Gabbett, T.J., Mitchell, J. Fitzgerald, E. Osborne, M.A., Gray, A.J. (2015) Running Intensity Fluctuations in Elite Rugby Sevens Performance. International Journal of Sports Physiology and Performance. 10(6), 802-807. Gray, A.J. and Jenkins D.G., Match Analysis and the Physiological Demands of Australian Football, Sports Medicine, 40(4), 347-360, 2010. Gray, A. J., Jenkins, D., Andrews, M.H., Taaffe, D.T. and Glover, M.L., Validity and reliability of GPS for measuring distance travelled in field-based team sports, Journal of Sports Sciences, 28(12), 1319-1325, 2010. Gray, A.J., Jenkins, D.G., Andrews, M.H., Taaffe, D.R. and Glover, M.L. (2010, 1- 3 June). Validity of GPS for measuring distance travelled in cricket, Paper presented at the Conference of Science, Medicine & Coaching in Cricket, Gold Coast, Australia, 2010. Gray, A.J., Jenkins, D.G. and Andrews, M.H, Monitoring running workloads in field based team sports: A new energetic approach using GPS technology, Paper presented at the 2010 Asics Conference of Science and Medicine in Sport, Port Douglas, Australia, 3-6 November 2010.